Outgate Bed and Breakfasts. Compare latest rates and Live availability for all your favourite places and places you have always wanted to go using our new My Shortlist feature. Click + to add to your Shortlist. Bed and Breakfasts in Outgate, Cumbria for 1 night from Wed Apr 24, 2019 to Thu Apr 25, 2019 within 10 miles, in an Average Nightly price range of £1 to £200. Ees Wyke Country House is an elegant Georgian property in the Lake District, less than 3 miles from the town of Hawkshead. Set on high-ground the house overlooks Esthwaite Water and offers free parking. Ees Wyke, once a holiday home of Beatrix Potter, features 2 traditional lounges, both with a fireplace. Stunning views of some of the most well-known fells in the Lake District can be enjoyed from the terrace area. Bedrooms feature striking picturesque views of the surrounding countryside. Each room includes an en suite bathroom, as well as a TV. Some rooms also feature slopped beamed ceilings. Most mornings you will awake to the aroma of freshly baked bread, which accompanies the locally sourced bacon and Cumberland sausage at breakfast. In addition to this there is a menu featuring tasty options such as Loch Fyne kippers. The Lake District is famed for its many countryside walks and the Moss Eccles Tarn walk starts from the house. The Windermere Ferry is 2 miles from the house and goes to Ferry Nab near Bowness-On-Windermere. Welcome to The Willowsmere B B in Windermere. We offer elegant and spacious AA bed and breakfast accommodation in the heart of the Lake District. We have an alcohol licence and free WiFi as well as award winning gardens to relax in. We also have ample car parking with CCTV cameras meaning we are very car and biker friendly. New owner Anthony invites you to come and unwind at The Willowsmere Guest House in the beautiful Lake District National Park where you will be offered a home from home atmosphere and everything you need to make your stay a complete and relaxing experience. The imposing Lakeland stone building dates from the 1850 s when it served as a Gentlemens residence but it has been a hotel or a guest house for the last 50 years or so. We are ideally positioned to act as a base for your Lake District holiday. The many local attractions in Windermere Bowness-on-Windermere and Ambleside are within easy walking distance and we are well located to act as a base from which to explore the wealth of attractions on offer in the Lake District and Cumbria. This hotel is situated in the centre of the village of Bowness-on-Windermere, just 2 minutes' walk from the World of Beatrix Potter Attraction. Wi-Fi is free in public areas. Rooms at White House Hotel & Restaurant are clean and functional, with private bathrooms and facilities for making tea and coffee. Some also offer picturesque views A choice of restaurants are less than 5 minutes away on foot. The nearby town dates back to the Middle Ages, with picturesque old lanes to walk along. Parking is available in 3 car parks within a minute's walk from the building, and Windermere Rail Station is a mile away. On the shores of Lake Windermere, Macdonald Old England Hotel & Spa has an award-winning restaurant, a beauty spa and scenic views. Windermere centre is a 20-minute walk away. Surcharge valet parking is available on site. The rooms at Old England Hotel each have a flat-screen TV and tea/coffee facilities with mineral water. The bathrooms feature fluffy robes and free toiletries, and some rooms have lake views. With 2 AA Rosettes, the restaurant serves a modern menu featuring quality local produce and organic ingredients. Terrace Bar and Lounge offer light meals and traditional afternoon teas. The modern leisure centre features a fully equipped gym and 20-metre swimming pool. Guests can relax in the ice room, sauna or aroma steam room, and try indulgent treatments in the beauty salon. 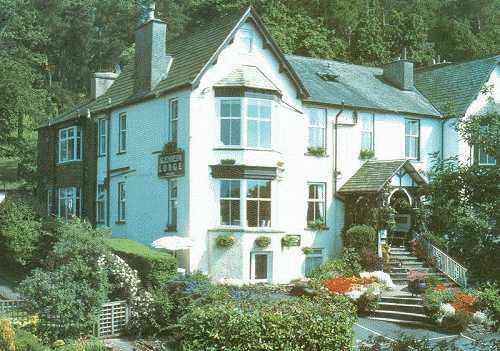 In Bowness-on-Windermere, the Macdonald Old England Hotel is set in mature gardens, and has its own private boat moorings. Beatrix Potter Exhibition is 200 metres away. Built in 1845, The Laura Ashley - Belsfield Hotel is an award-winning hotel that stands in 6 acres of gardens with unparalleled views over Lake Windermere. The hotel has been awarded 4 Black AA Stars and 2 Rosettes. The en suite rooms enjoy designer furnishings, and feature satellite TV. Many have views of the lake and the mountains, and ground-floor rooms are available. Free Wi-Fi and free on-site parking are available. Dining is available in the Belsfield Restaurant and Belsfield Brasserie, with drinks in the Lounge Bar and opportunities to relax and take tea or coffee in the Drawing Room and Library. The hotel is 5 minutes' walk from the centre of Bowness, the World of Beatrix Potter museum and from Lake Windermere itself. It is also just 5.5 miles from Tarn Hows. The property has state of the art conferencing facilities for hosting company events. Latimer House guest house built in 1850 is an elegant and spacious Lakeland Victorian home in Bowness-on-Windermere Cumbria. Lovingly cared for by the resident owners who run this exclusive four star accommodation for non-smokers. This peaceful, family-run Lake District hotel is a 5-minute stroll from Lake Windermere. It offers an award-winning restaurant, free Wi-Fi and free parking. The Burn How's rooms are all situated in the private grounds, away from the main building. Each individually decorated room has a luxury bathroom, and a flat-screen TV. The restaurant overlooks the garden and serves a menu including local venison, trout and lamb, along with ice cream and cheeses. There is a relaxing lounge, a patio and a bar stocking local beers. Guests can take countryside walks from the hotel, or a cruise on Lake Windermere. The Lake District is perfect for cycling, and the hotel provides secure bike storage. Windermere has restaurants, bars and the World of Beatrix Potter Attraction, all 5 minutes' walk from the Burn How. br / br / Set in Bowness we are just a few minutes walk from the World of Beatrix Potter and Lake Windermere itself and with a superb choice of restaurants shops and traditional pubs. Bowness Bay is just a six minute walk. br / br / br / br / Try a boat ride on Lake Windermere visit Beatrix Potter s house HILLTOP nearby br / br / br / br / Bowness-on-Windermere is Cumbria s most popular destination with the town busy for much of the year. People come to enjoy the lake for sailing and Watersports or just to relax and enjoy the atmosphere of the area and the town s delightful setting. br / br / br / br / br / br / br / br / br / br / br / br / br / br / br / br / . You will always get a warm and friendly welcome at Puddle Duck Lodge our picturesque cottage. Built from traditional lakeland stone in 1864 on the quiet Biskey Howe road it is the ideal base for which ever type of holiday break you choose. br / br / br / br / You may want to relax and simply wander through the diverse selection of shops restaurants and pubs. Sit by the lake a 7 minute walk taking in the stunning view whilst eating a local ice cream or take a pleasant boat trip. You might take a drive through some of the most stunning scenery in the country or wish to do something much more energetic. br / br / br / br / There is a vast array of activities in the area including The Royalty our local traditional cinema just a 2 minute walk away the World of Beatrix Potter Attraction 5 minutes the brand new Museum of Boats 10 minutes The Old Laundry Theatre 7 mins and gorgeous views from Biskey Howe View 7 mins. br / br / br / br / Puddle Duck Lodge has seating areas in the pretty garden free wifi free parking in our own private adjoining car park. br / br / br / br / Some of our rooms are dog friendly please enquire with us direct before booking to avoid disappointment you may be surprised at how many shops pubs and eateries are dog friendly too! br / br / br / br / Puddle Duck Lodge has 3 newly refurbished attractive Individually designed rooms. Including a beautiful suite a romantic four poster and a deluxe single brand new bathrooms with power showers and all overlooking our cottage garden. br / br / br / br / Tasty complimentary breakfasts are delivered to your room each has a table and chairs for your comfort and bathrobes are provided so you can eat at your leisure. This can also take out the worry of where to leave your dog whilst having breakfast. Burnside Hotel and Spa is the perfect base for discovering (or revisiting) the wonders of Windermere. Set in mature gardens with breathtaking views over lake itself vistas across the fabulous fells and just minutes from the steamer piers and bustling village centre of Bowness-on-Windermere this delightful corner of Cumbria has it all. Whether you want to explore the historic the cultural or the contemporary we re within easy reach of attractions as well as towns villages and rural retreats that are scattered across the Lake District. Come along to Cumbria and you ll literally see why so many people come back time and again. We are currently undergoing major refurbishments. Take advantage of a great rate in one of our standard rooms overlooking building work taking place outside from 8.00am until 5.00pm Monday to Saturday. For further details please contact hotel reception on 015394 42211.